Both were accompanied with consequences. We choose to attend because the consequences/benefits were more appealing or less horrific, depending on how you look at it. That’s it. That is the grand sum of what I remember about Economics 101. Since that time, I have had zero interest in Economics. 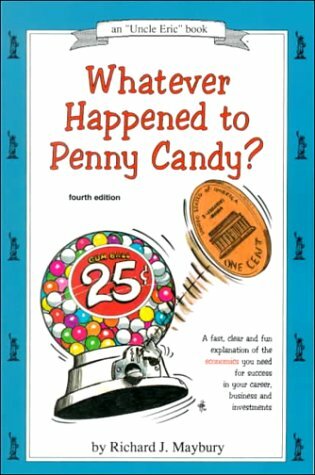 That is until 3 weeks ago when I began reading Whatever Happened To Penny Candy by Richard. J Maybury, part of our Core 5 curriculum. It never ceases to amaze me when I find out, yet again, that a subject which was presented as extremely boring and tedious during my stint in government school, is actually fascinating! Rabbit Trail—> If you are a parent educating a child through the government school system, please, please, please do not see this as a judgment or insult directed at you. It is not. I understand that homeschooling is not for everyone. In fact, I loudly proclaim that it is not. I call these government schools because that is what they are. They are paid for and run by the government. Period. Back to Economics. Did you know that rising prices are not inflation? They are a result of inflation. Inflation is actually when the government puts a greater amount of currency into circulation. They inflate the money supply. Did you know that the recession/depression cycle is caused by inflation? With the strongest possible force, I recommend this book. Read it to your kids. Read it yourself. Explain it to someone. It will inspire you on many levels. This entry was posted on Wednesday, March 10th, 2010 at 11:49 am	and tagged with home school resources, lists, Sonlight You can follow any responses to this entry through the RSS 2.0 feed. One more winner from Sonlight [smile]. And while we're on the topic of economics, it's not actually the government that pays for stuff (since they don't generate money themselves). Rather, the government allocates tax payer's money to government schools. …and a lot of it [smile]. Glad you are enjoying economics. Learning can be such a joy! It is an interesting thing to think about, though. When I start to think about how much “control” the taxpayers have over the system, I am left with the impression that even were one to be successful in changing something that they found to be less than excellent in the school system (and I am talking about an addition, not a deletion, which would probably be enacted a bit quicker depending on the grounds) it wouldn't happen until their children were out. Turning around an aircraft carrier, so to speak.